The Bishop Diehl Rehabilitation Home (BDRH) for visually challenged, is a rehabilitation programme for visually challenged in the district of Tiruchirapalli. The program is being professionally managed under the patronage of Joseph Eye Hospital aiming at reducing the dependency of the blind through various psychosocial interventions. BDRH programme caters rehabilitation services for other disabilities also including hearing, speech impairment and also for physical and mentally retarded persons. The programs under Bishop Diehl Rehabilitation Home are very much integrated into the mainstream services. It identifies the unique inherent capabilities of its clients and attempts to make them recognise the same. It offers mobility training, vocational training in paper cup making, caning of chairs, envelope making, candle making, umbrella assembling, file making, eye pad cutting and also provides training in the printing press etc. They also produce envelope covers, candle making, recaning and weaving; these are made based on the orders. A small canteen is maintained inside the Hospital by a Differently abled person. 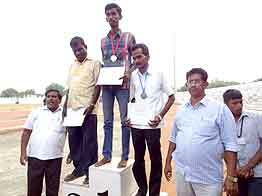 BDRH inmates participated in District Para Olympics, organised by District Welfare committee and 14 people with disabilities won prizes. Our team gave orientation to the polling officer towards Legislative assembly election with regard to wheelchair handling.